Master Marc teaches a student how to perform a palm strike. Master Ashraf teaches a throw and control technique. New Edge Martial Arts is operated by Master Marc Saurbier, 5th Dan, and Master Ashraf Soheim, 4th Dan. Both instructors hold their black belt ranks in the Korean arts of Taekwondo as well as Tang Soo Do, Moo Duk Kwan. 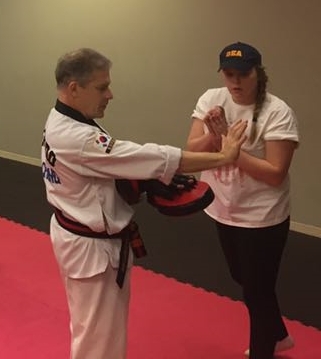 Master Soheim has also attained the rank of 1st Dan in Hapkido, and has a passion for studying hands-on self defense techniques. Master Marc has been training in the Korean arts for several decades, and enjoys motivating young students to aim for their best potential. They educate students at New Edge with a welcoming and inspiring energy, dedicated to instilling positive physical and mental attributes into everyone who attends classes at the school. Both instructors share a common lineage of learning from Senior Master Kevin Nilson, Master Cindie Lee New, and Senior Grand Master James Sun Hwan Chung. 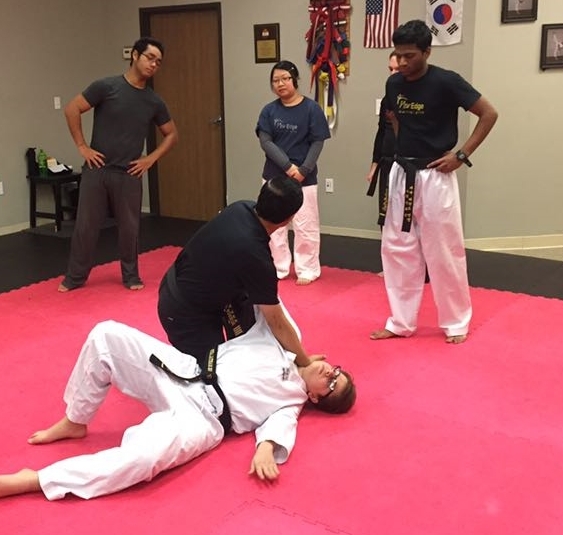 Several teen black belt and advanced adult students help instruct classes at New Edge Martial Arts on a regular basis. This better ensures that students receive more personal attention during their training. New Edge also boasts having many high ranking black belts that either help with or teach classes on their own times. Master Mike Fuller (4th Dan), Master Lou Zedan (5th Dan), Sergeant Joe Ferrera (30+ years teaching/law enforcement experience), Jason Fox (2nd Dan), Dustin Hoffman (1st Dan), and other black belts all share their own insights and skills with their fellow students.